Your Spanglefish site makes it easy to upload documents and have them available for download by your users through standard links. The advantage to providing files in this way is that you can ensure they are formatted neatly and are easy to print (i.e. PDFs) - very handy if you want users to be able to print out price-lists or menus, for instance. NOTE: Your site includes a Document Library facility for storing your files, and also includes a public 'Library' module page which makes all stored documents accessible to your users. However, many users want the convenience of being able to store many files, but only want users to have access to a few of them. For that reason, your 'public' Library page is set by default to 'protected' so that only you can see it when logged in. You can make the Library page fully accessible by changing its status to 'Visible' in Site Settings > Manage Pages > Change Page Visibility. Here's how you create a web link pointing to a document file, so that users can download it from your Document Library . .
1) Navigate to the page of your site where you want to provide a text link whihc, when clicked, downloads a document. 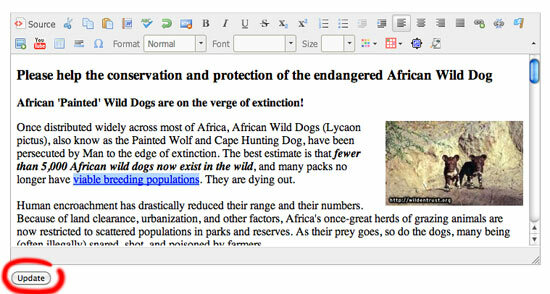 Click on the 'Edit Page Text' button to enter editing mode. 2) Click and drag your cursor on the section of text which you want to make into a link - you'll see that this highlights in blue. 3) With the text highlighted, click on the 'Link' icon in the text editing toolbar - it's a small chain-link icon at the right side of the first row of icons. 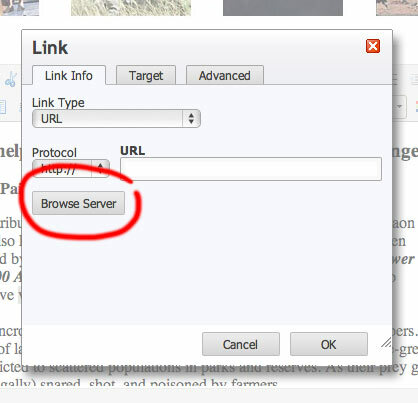 A Link pop-up window opens. 4) Click on the 'Browse Server' button, and this opens a new window showing your Document Library with folders and files within it. 5) Click on the file name of the document you want to link to - you may have to click on a folder in the left column to find the nested file you want - and the Document Library window closes. 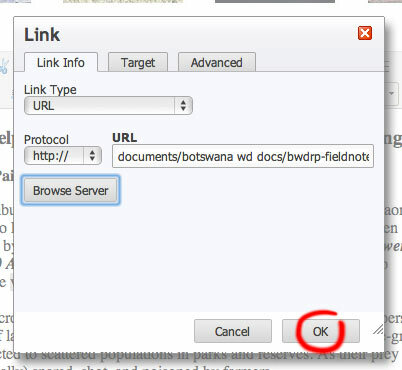 6) In the Link pop-up window, click on the 'OK' button to confirm the link, and the Link pop-up window will close. 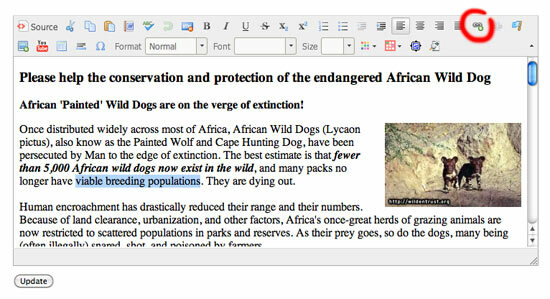 7) In the text editor you will now see that the highlighted text is also now underlined, indicating that this is now an active link. Click on the 'Update' button below the text box to confirm the editing. You can now click on the link on the page to test that the link works correctly. NOTE: When users click on the link on your page to download the document it may download to their computer, or simply open in a new browser window, depending on how they have their web browser configured.